It is All Saints Sunday, a day greeted by many Christians with particular joy. For some, it is a time when we remember how connected we are to all who have gone before us in Christ – that in Christ we shall know not only the resurrection but reunion. I find the image above rather stilted in its highly stylized way, but I appreciate the evocation of the bands of generations who live around Christ, past present and future. 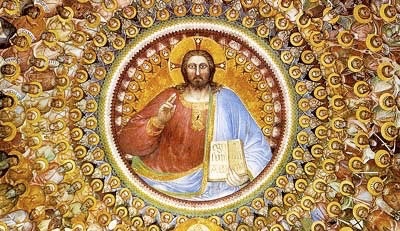 For others, it is a time to rejoice that we are all ‘saints’ or ‘holy’ (depending on whether you prefer an English word with a Latin or Greek derivative) right now – not in the sense of any personal accomplishment or quality, but rather because in baptism we belong to the ‘Holy One’, and are loved with a love that will not let us go and given a calling to live in and be that love in this time and place. For myself, I am approaching ‘all saints’ with another perspective this year. We are progressing through an exploration of the ‘ten words’ of God given at Sinai, and have reached ‘you shall not steal’. As I hear this word, I think of another dimension of community. And I am aided in this by Jean Calvin, who suggested that we read the ten commandments according to two principles. One is that each part points to a greater whole. The other is that each prohibition is a positive exhortation. In the light of ‘all saints’, I hear ‘you shall not steal’ as the exhortation ‘you shall share’. And I wonder how different our cities and world would be if remembered that we are in this together with all humanity, that life is something that is honoured and enjoyed in the sharing. In a recent article, Jim Wallis of Sojourners wrote about his experience at the recent Parliament of World’s Religions, and the identification there of income inequality as a spiritual issue (link). As we gather for Holy Communion, I will be thinking about community, and my Christian commitments to neighbours near and far. Have a look at the Order of Service below and join us in the worship of God if you are in the area!